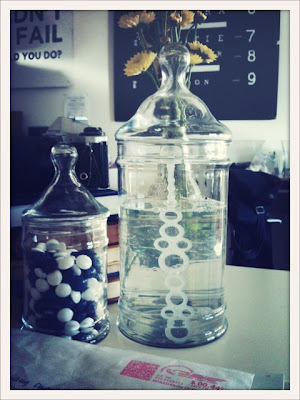 My dear friend Lindsey who works at our non profit gointernational.tv had this cute bubble vase sitting on her desk today. You can get a table top vase like hers for a couple of bucks at Walmart and she picked up the bubbles at the dollar tree. I'm thinking I need to make one like this for home. My little Zion would love it!! It's been a while since I've blogged, I know. Life has been busy! I Would love to hear from my faithful readers of any of you are still out there! Take a quick sec and say hello!